Every Sunday afternoon at around 4pm at the fresh food market near my home, every shop will start to discount their products as they will be closed on Monday and Tuesday. I go there sometimes and usually get a lot of things at a very good price. It is also a good time to try something that I haven’t tried cooking with. If I like the new ingredient that is good, if not I only paid a little bit and have no regrets. Last week I went there and got a bag of “Sand whiting fish” there were 3 fish in the bag for only $5. I brought it home and tried to think what to do with them. With other ingredients that I got I created the dish called “Pad Phed” which is spicy stir fry. Spicy stir fry can be used with many types of protein such as chicken, pork, beef and fish. 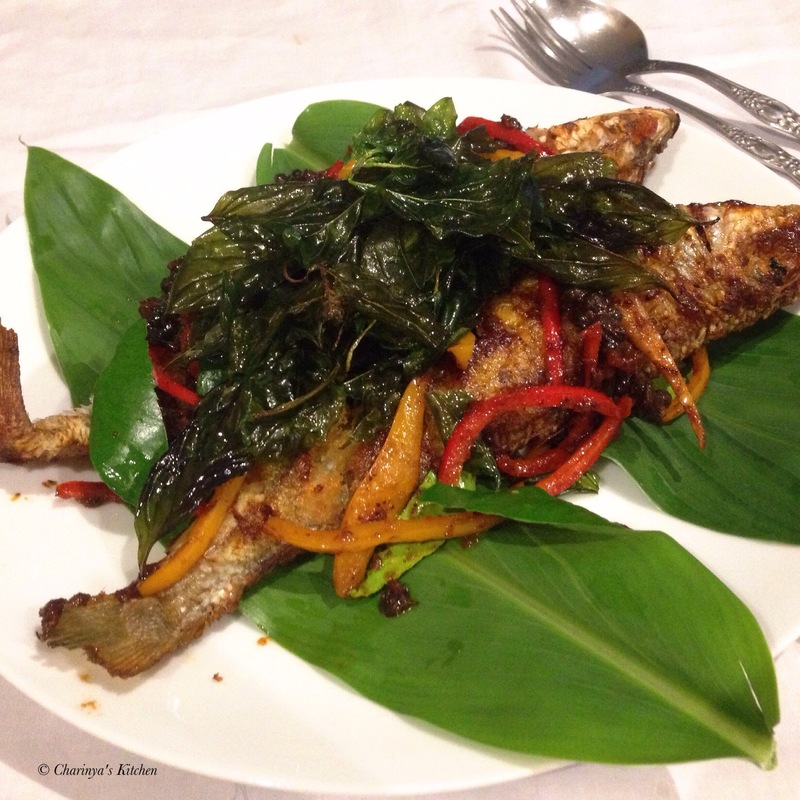 The fish commonly used for stir fry is “Cat fish” in a dish called “Pad Phed Pla Dook” (Spicy stir fried cat fish). 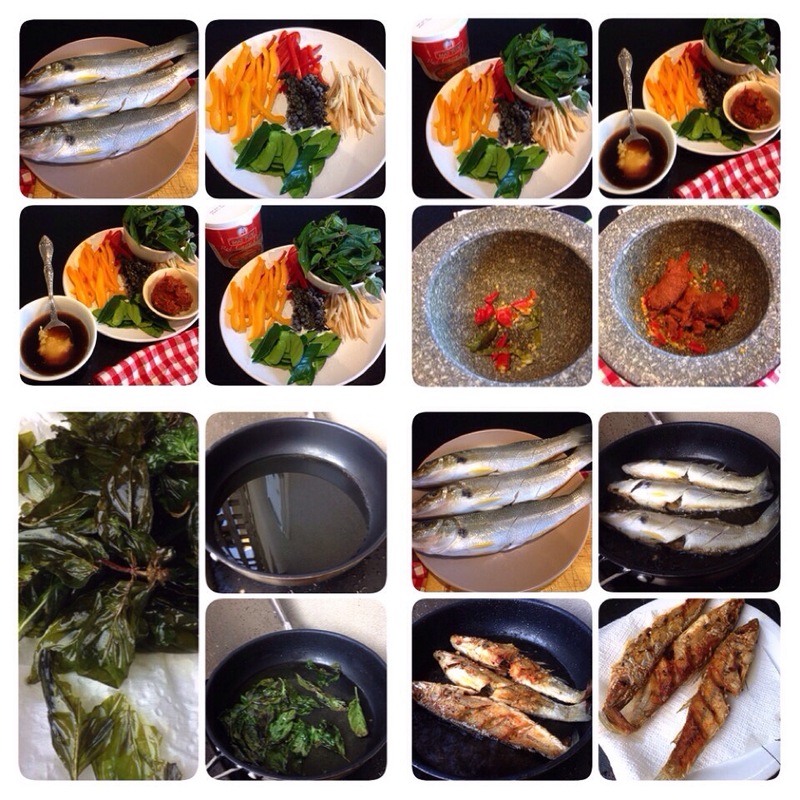 This time instead of cat fish I used the sand whiting that I bought from the fresh food market. • 3 medium size sand whiting fish. Descale, clean and score 3 lines on the side. I used the whole fish, but if you prefer fillet that is fine. • 1/2 cup sliced red and yellow chilies or capsicum. • 1/4 sliced wide ginger (Kra chay). This is available pickled in a jar at Asian grocery shops. • 3-4 green pepper corns. • 7-8 kafir lime leaves. • 1 cup Thai basil. • 1 tbsp red chilli paste. • 3 chilli (optional) I added this for extra heat. • 2-3 pieces kafir lime rind (optional) which I added for freshness. Grind chilli paste, fresh chilli and kafir lime rind together and you have chilli paste ready to use. Mix the sauces and sugar together in a small bowl and set aside until required. 1. Add a generous amount of oil in a frying pan and when hot add Thai basil leaves until crispy. Be careful that your basil leaves have been patted dry so the oil does not splash everywhere. Remove the crispy basil and set aside until required. If you don’t want to use crispy basil you can also add fresh basil when you fry the dish. 2. Fry the fish until crispy and remove the fish and set aside. 3. Remove most oil from the frying pan leaving around 2 tablespoons. 4. 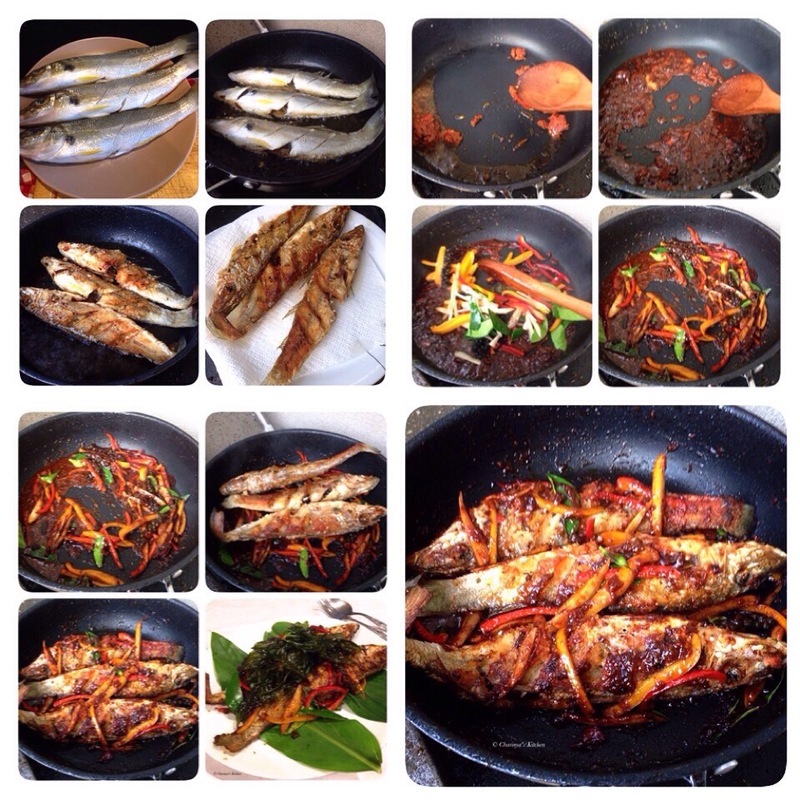 Add chilli paste in the pan and fry for a few minutes. 5. Add seasoning sauce then add sliced red, yellow chilli, kafir lime leaves, green pepper corns and wide ginger. Fry for a few minutes then add around 1/4 cup of water. Wait until it has boiled. 6. Add crispy fish and mix well with the sauce. 7. Serve the fish on a plate and top with crispy basil.